Ouch! That Stereotype Hurts will help you be a more effective communicator in today’s diverse business environment. 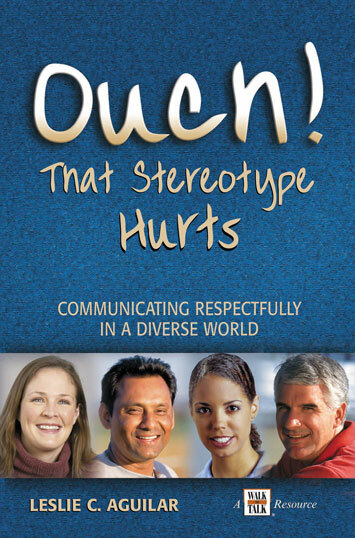 The book provides guidelines for communicating respect and inclusion, a six-step model for how to recover when you have unintentionally said something you wish you hadn't and your foot is in your mouth, and 12 techniques for speaking up against bias and stereotypes. About The Publisher Since 1977, The WALK THE TALK® Company has helped organizations, worldwide, achieve success through Ethical Leadership and Values-Based Business Practices. They offer a full range of proven resources and customized services - all designed to help you turn shared values like Integrity, Respect, Responsibility, Customer Service, Trust, Communication and Commitment into workplace realities. I loved your Ouch! book! Read it cover to cover. What I liked about it was that there were such great concrete examples. And the examples covered a broad continuum – from cool, casual comments to more formal ways to express oneself. The book offers so many valuable and useful perspectives that are hard to find elsewhere. I love the DJ example of “Whoa, I'm not going there.” So many people don't know what to say. I used this book as a unit in my “Interpersonal Communication” course and my students all responded enthusiastically. What a great balance of information and insight without being preachy, Leslie. Thank you! What do you do if someone you care about is the target of demeaning stereotypes? What if you are being demeaned or stereotyped? How often do you speak up on behalf of respect? … is a 30-minute individual, self-paced, guided eLearning program. Based on the ground-breaking Ouch! 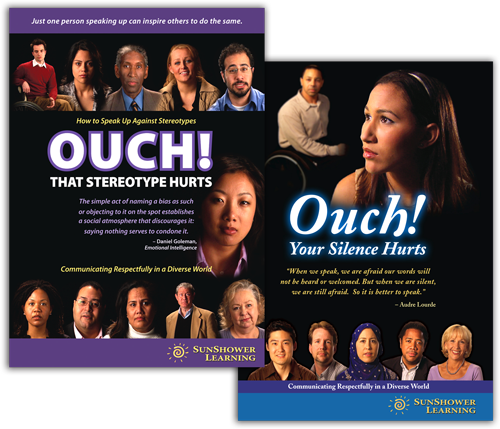 That Stereotype Hurts video, this powerful program enables learners to explore communication skills for promoting inclusion and respect in the workplace. In a unique and powerful way, viewers will experience the impact of stereotypical comments, explore why people don’t speak up against stereotypes and other biased behaviors, and learn six techniques for speaking up without blame or guilt. Staying silent in the face of demeaning comments, stereotypes or bias allows these attitudes and behaviors to thrive. This undermines our ability to create an inclusive workplace where all employees are welcomed, treated with respect and able to do their best work. Yet, most employees and leaders who want to speak up don’t know how. So, we say nothing. Experience the impact of stereotypes and biased statements, even when causally said. 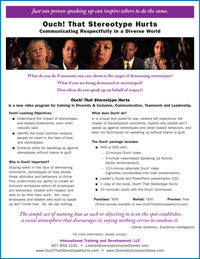 Enhance skills for speaking up against stereotypes and demeaning comments without blame or shame. Having worked in the diversity / inclusion field for over twenty years, I have been privileged to encounter dozens of valuable products designed to increase both awareness and skills. 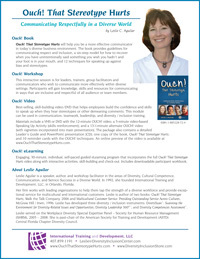 None has surpassed Leslie Aguilar's training video, Ouch! That Stereotype Hurts! and I was thrilled to recently learn that the Ouch! 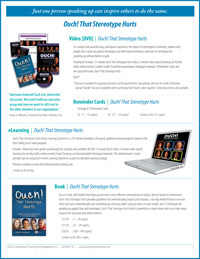 material and message is now available in an eLearning format. I just completed it and found it straight-forward, easy-to-follow, and, as with the video, filled with practical skills. Perhaps most important, there is something about the design that made me want to keep clicking and moving on – maybe it's the flow of the content or the "look" of it, but it seemed to carry me along. Great job, Leslie! Would you like to preview Ouch! eLearning? Just fill out the form below to experience Ouch! That Stereotype Hurts Online Learning. We recommend utilizing this eLearning on a non-mobile device to preserve the integrity of the experience. If you encounter any hiccups with the browser of your choice, you may want to try one of these browsers: Internet Explorer / Firefox / Safari. This interactive session is for leaders, trainers, group facilitators and communicators who wish to communicate more effectively within diverse settings. Participants will gain knowledge, skills and resources for communicating in ways that are inclusive and respectful of all audience or team members. For further information or to schedule a presentation, click HERE to contact Leslie Aguilar. 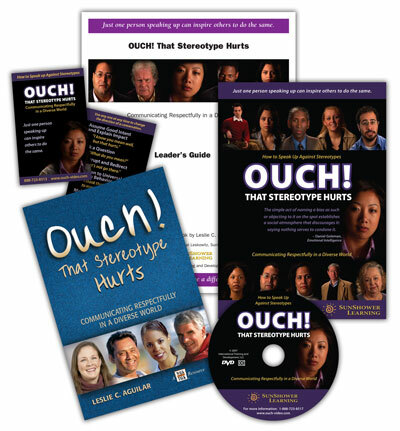 Continue the Conversation with Ouch! Your Silence Hurts! Examine the impact of the silent bystander. Ouch! Your Silence Hurts will inspire conversations beyond the training room! Ouch! Your Silence Hurts goes more deeply into the pivotal role of the bystander and how you and others can become active allies. A complete training program that inspires passive bystanders to become active allies. Based on the ground-breaking book, Ouch! That Stereotype Hurts, by Leslie C. Aguilar. This preview shows the entire 9-minute Ouch! Your Silence Hurts video. Extra video features are not included in this preview. Understand the high cost of silent collusion. Explore the power of the bystander to make a difference. I have one word, FABULOUS!!! This video gives real, gut-wrenching examples of individuals and situations. Most important, it challenges people and gives them the idea that they have the ability to confront stereotypes by showing them how. Ouch! Your Silence Hurts will be so helpful because most people want to do something, but don't know what or how.